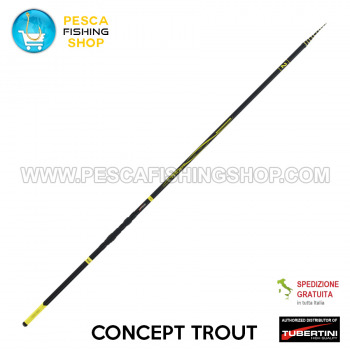 The Concept Trout rod series is at the top of the Tubertini range. Developed on thin-profile mandrels and with new carbon layers, the barrels are very performing. They are light, suitable to meet the needs of the most demanding agonist. Further innovation is represented by the use of very light titanium rings with a reduced profile, which do not modify the original action of the barrel. The reel seat plate is San Fu and the ligatures are valuable. The finish is sober and elegant. Buy now Concept Trout Tubertini and you will receive it at your home, well packed. We will be available to follow the shipment with you.